"This hearty Indiana gumbo is great anytime of year, but especially when it's cold outside and you and your friends are huddled around the tube watching the game. Any of the meats may be substituted or omitted to suite your own tastes." Cook and stir flour in a large, heavy pot over medium-low heat until flour turns golden brown, about 15 minutes. Pour browned flour into a bowl and return pot to heat. Increase heat to medium and add oil to the pot. Cook and stir onions and bell peppers in hot oil until slightly softened, about 7 minutes. Stir garlic, thyme, and bay leaves into onion mixture; cook and stir for 1 minute. Add sausage to onion mixture and cook and stir until browned and crumbly, 5 to 10 minutes. Stir diced tomatoes with juice, shredded chicken, chicken broth, vegetable juice cocktail, browned flour, and Creole seasoning into sausage mixture. Bring to a boil, reduce heat to low, cover the pot, and simmer, stirring often, until mixture is hot and flavors blend, 20 to 30 minutes. Pour shrimp into sausage-chicken mixture; bring to a simmer. Cook shrimp until they are pink on the outside and the meat is no longer transparent in the center, about 5 minutes. Discard bay leaves. Season gumbo with salt and pepper to taste. 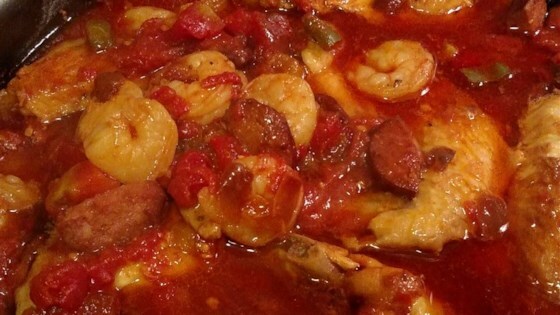 If you like a tomato based gumbo this is for you. I substituted the v8 with more chicken broth. Still tomatoie. If that's a word lol. I seen the stars aka ratings and just went with the receipe. Great recipe -- I crushed tomatoes instead of diced - and Swansons canned chicken - I literally had all the ingredients in the house! Made cornbread to serve with it! Yummy and easy! Fantastic, the the right amount of spice! I didn't have enough shrimp, so I added pieces of scallops to make up the difference. Love it!! This was just THE BEST! I had so many compliments on this dish. The only thing I did differently was adding a can of Rotel in place of the V8. I will make this many times!